The most recent HMIe reports for primaries in the Cambuslang and Rutherglen Area of South Lanarkshire are those for: St Anthony’s Primary, St Bride’s and also Calderwood Primary with the follow through on Loch also recently published, all showing the fantastic quality of schools in the area. Fabulous work going on and we are all ever so proud of the children, parents and staff in the area. All of these establishments are well on their journey to excellence. The latest nursery publication in the area, is the HMIe report on Cathkin Community Nursery which came out today. The nursery has been evaluated as excellent in all the QIs in the report. I’m not ashamed to admit that I bubbled all the way through the feedback dialogue session the other week. It was just fantastic to hear the hard work of the team being praised to the hilt. Every word was deserved. Last year the nursery was graded across the board at 6 by the care commission. As far as I am aware this is the first Scottish nursery to have achieved all 6’s from care commission then have all excellents the next year from a joint HMIe/Care Commission Inspection. Pretty special! The start the children are given in their educational journey at the nursery is outstanding. Well done to everyone involved with the nursery. I mustn’t forget to mention Liz and Karen – two very special leaders who are providing something immeasurable for the children in their care. Something which is making a difference not only to the children there now but as Patrick Duignan talks about – to future children in ways we will never know. 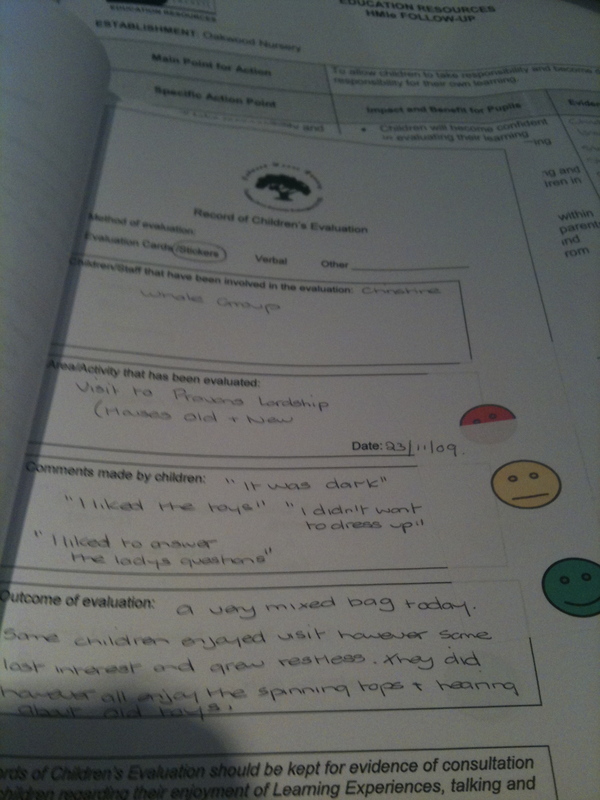 HMIe feedback after visit to Cathkin Community Nursery was very positive. The report will be published in the next few weeks when the gradings etc are all confirmed. In May they are holding an open doors cpd event for teachers, early years workers etc in SLC. At this event the nursery staff will be running a series of workshops on topics such as persona dolls, planning and of course the eyepet project. HMIe mentioned the fabulous work going on around the pets project and were impressed by the use of the eyepet as a stimulus/motivator which led to the focus. 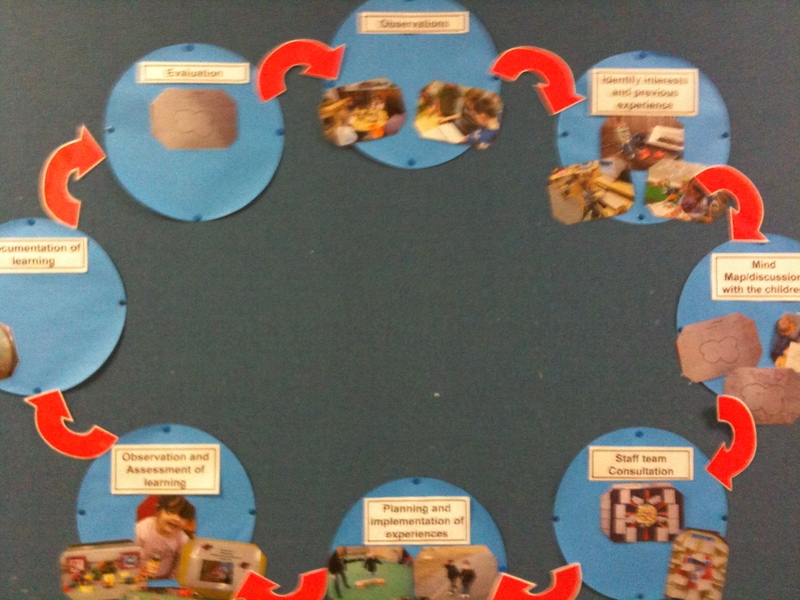 I’ve mentioned in previous posts how the mindmapping process and consultation with parents and children is carried out for a focus in the nursery. Some lovely learning experiences which are evidenced around the nursery over the past few weeks linking in to pets – each group with key worker, hatching/nurturing/caring for an eyepet including the youngest children under 3! Caring for goldfish in playrooms, bringing in fish from fish counters on ice and investigating these, children’s drawings and paintings inspired by pet pictures by artists such as Monet and Andy Warhol, visits to Pet shops, visitors in to nursery linked to pets, photographs by children of their own pets and home links, use of video camera and digital camera by children in playroom, pet corner made and designed by children where they dress up as pets to be sold, use money etc etc, sensory area with linked activities, emergent writing and mark making at all areas in the nursery where the children record what they are doing, the list goes on. The key however is not really about the eyepet it is about the opportunities provided for learning – like any fantastic practitioners they listen to the children, follow their interests and balance that with staff knowledge about outcomes and direction of learning needs, then use learning tools to make the learning experiences enjoyable, exciting and challenging. The eyepet has been a great tool which has lifted motivation, interest, enjoyment and added in fun. It has not however been used as a bit of tech for tech’s sake. Its been about learning! It has also given a means of our being able to gather evidence of how they staff go about the planning, observation, evaluation process and this will be gathered, published and shared in various ways over the next few weeks. A truly inspiring place – and the question I would ask is – would I send my own child there? The answer is that I would fight to get them a place! The Early Years Forum in our area meet every 6 weeks or so. Its very much a drop in session, sometimes with them doing some work together, listening to someone talk etc. Brain McLaren from the consolarium came along last night with some playstation, Wiis, Nintendo DS stuff etc. Have a look at their recently updated Glow group, which is looking quite nifty. As always the eyepet stole the show with the early years people! 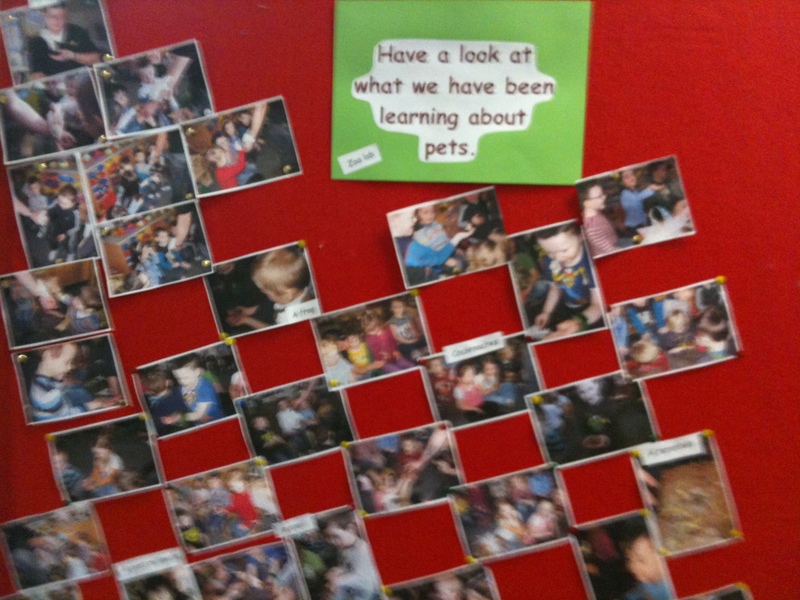 Cathkin Community Nursery are working away with their eyepets and developing a focus around the theme pets. Ask the children key questions – What? Who? When? Where? Why? SLCTV are in Calderwood Primary today filming some of the recent Burns Competition Winners, so it all looks very exciting downstairs today! Later on they are hosting a small retiral tea for some of the senior education staff who are leaving SLC over the next few weeks. Lorraine Bell, Jessie McPerson and May Boyd. We’re all looking forward to catching up and wishing them luck in the next stage of their lives. The staff at Cathkin Community Nursery are in the middle of planning and carrying out activities around the focus “Pets”. To add a bit of excitement to this context they are using the eyepet. We’re going to collect this planning so other establishments can see how the nursery goes about planning with the children, parents and all involved in the children’s lives. In May the nursery is holding an Open Doors Event which will have 8 workshops run by staff. It will be open to Early Years establishments and early stage primaries in the Rutherglen, Cambuslang and East Kilbride areas. This follows on from successful work done in EK schools trying out open doors events. Couple of photos below show some of the planning under way. At the nursery they use a mindmap approach to planning – they listen and observe and list “buzzwords” that the children are talking about. The staff team come together talk about the buzzwords and discuss possible focus ideas and outcomes. 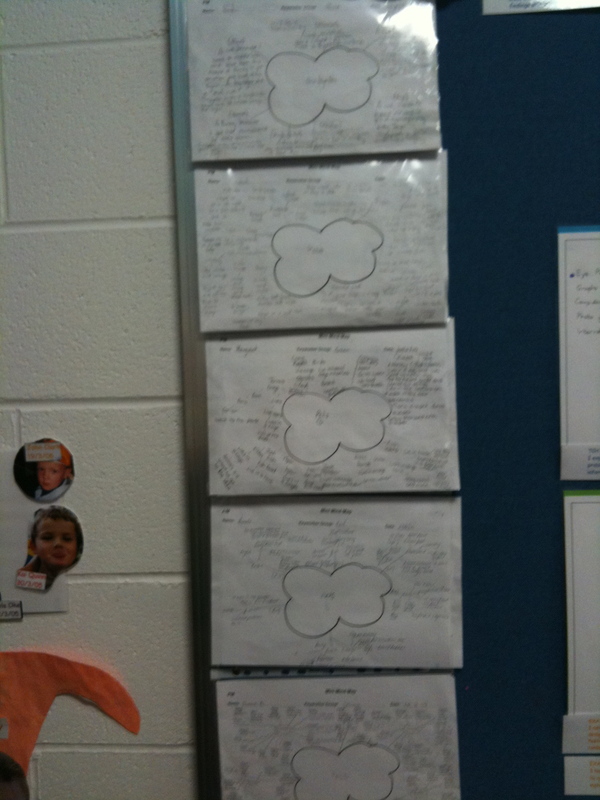 Children work with staff to develop a mindmap of the kind of things they would like to learn, find out about, try etc. 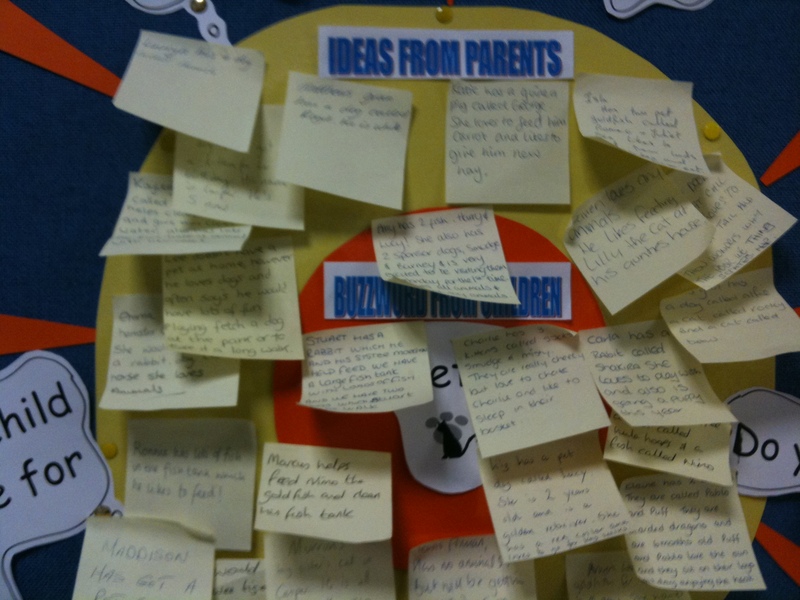 You can also see the materials which go up on the wall so that parents can add in ideas and thoughts about the focus. 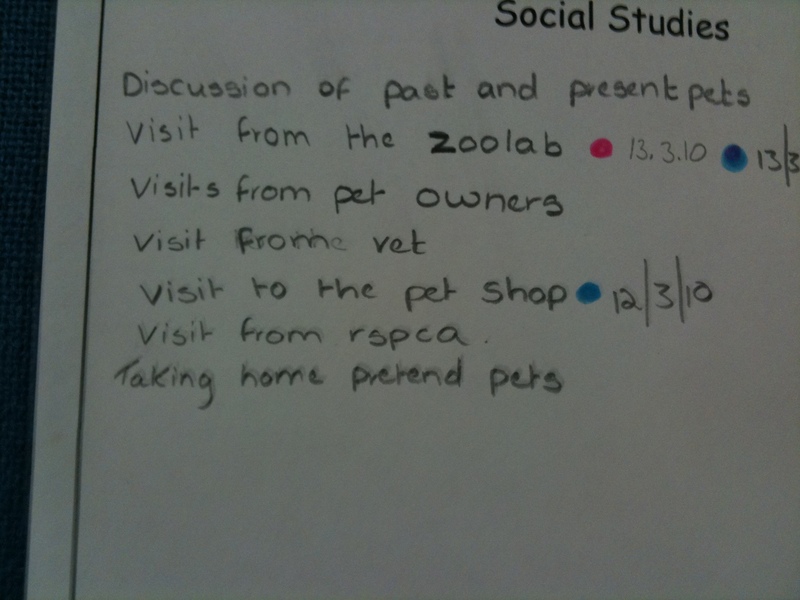 Asking for ideas from parents about the pet focus…. 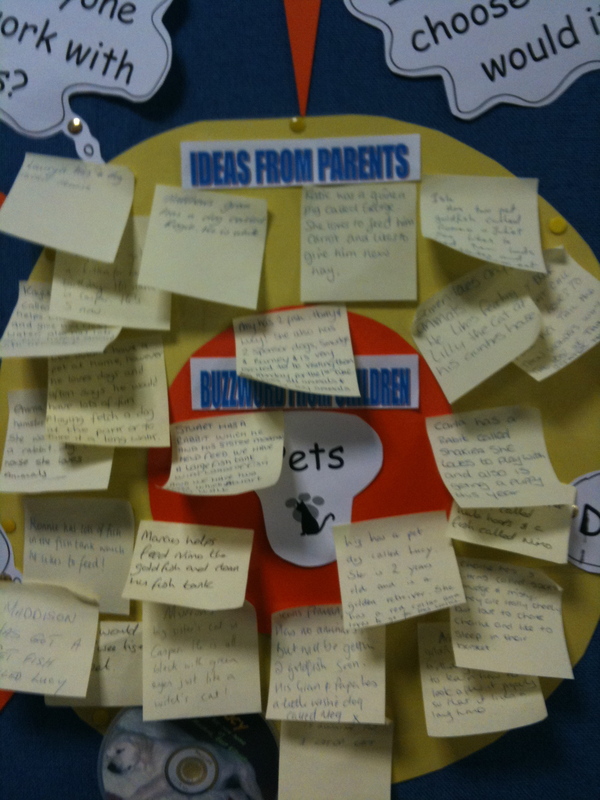 Ideas from parents about the pet focus on the sunshine display board…….. The initial mindmaps are going off to Brian McLaren at the consolarium and he’ll put them up on the glow group somewhere in the future. Saw this in Oakwood House Nursery this week. They are working on ways to record the children self and peer assessing their work. The children using individual self assessment cards and the staff record discussions with the children around learning experiensces using this format. Currently writing a follow through report on their HMIe visit a year ago. Lots of really great work going on in the partnership establishment! Enjoyed a visit to Little Pets partner nursery who ran a health day recently – great to see them inviting down local primary 1s to visit. Good transition work going on. Really enjoyed attending the HMIe dialogue session at the end of the visit to Calderwood primary on Friday. It has been a really positive week for the school, staff, parents and children. Well done everyone there. Looking forward to reading the report when it is published. Enjoying learning new things. 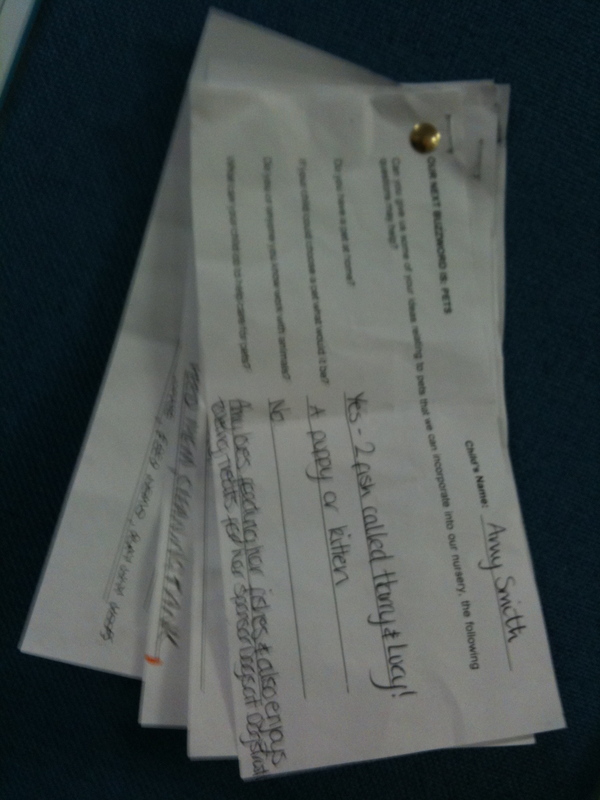 I have some additions to my remit and I’m having a great time getting my teeth into them. Have a strategic ICT role and am spending time with the IT Business manager learning about all things ICT, just great fun getting to grips with the whole picture. Also taking on primary staffing work and again loving getting my teeth into new aspects of work in the education department. Have had an invite to the official opening of one of the schools I work with – Loch Primary. They are awaiting the publication of their follow through HMIe report. The initial visit was carried out around two years ago and the HT had just taken up appointment at that time. Really pleased with the outcome of this too – and can’t wait to see it published. Amazing work done by the staff in the school. Big thumbs up all round to the impact HMIe have had working together with these and other establishments in the area! Busy week ahead, particularly looking forward to class visits at Hallside Primary. Neat little fans made by the Depute at Westburn Nursery. 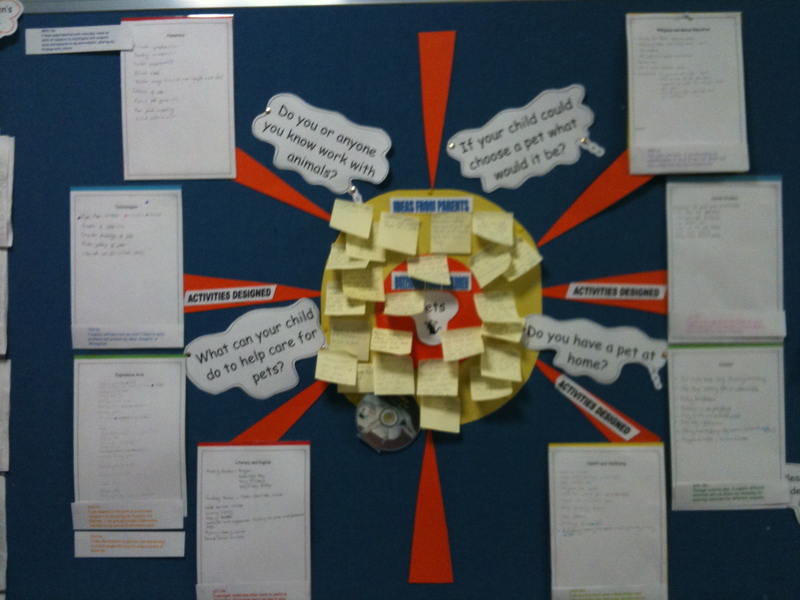 She took Blooms taxonomy and the starter questions which are within this blog from various sources and put them into an easy to manipulate format for the staff at the nursery. They hook these on to their badge lanyards and they are great reminders during the day and at planning sessions. 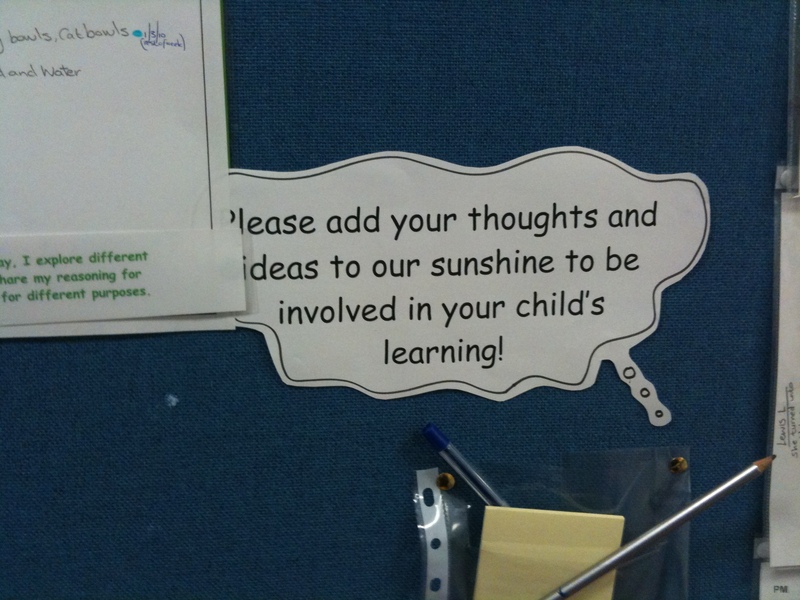 Equally useful for older children to use themselves in group discussions/feedback sessions etc etc. Add these to thinking dice, beach ball question prompts etc to raise the profile of these techniques or refresh AiFL work. Sometimes the cheaper option like these fans work just as well. 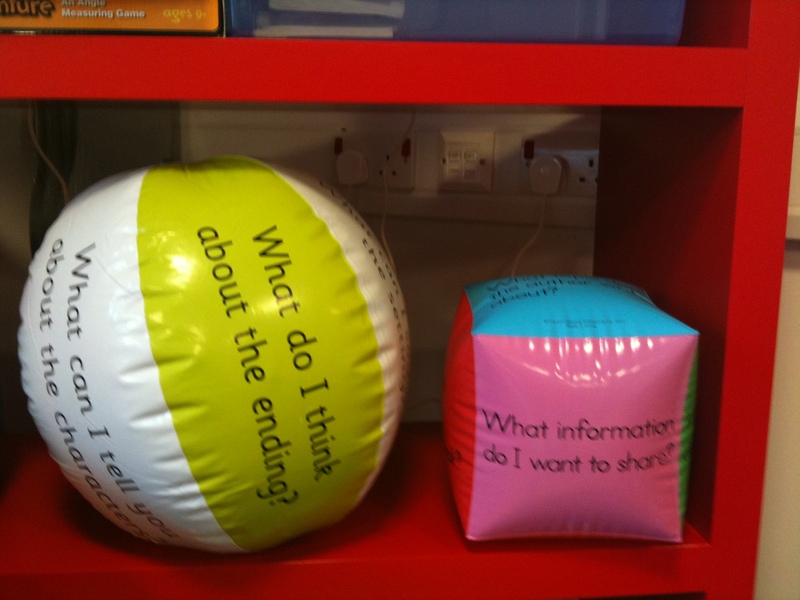 Its not hard to use the kind of ideas infant and early years staff have used for years to push eg great questioning further – an old football with sticky white labels on it with question starters written in pen, throw it round group – the sticker your thumb lands on when catching is the question to be answered etc. Nice article about Cathkin Community Nursery. Had great time at Glenburgh Nursery today. One of the EY workers who I used to teach (how old does that make me…) is about to set up a blog for the children to do emergent writing on. Another thank you to Ollie Bray who has inspired all sorts since his talk the other week here! Lots of nice things going on in Glenburgh. It was a hive of activity today with their individual achievement booklets getting put together for the new starts – lots of nice links within these showing movement in their CfE implementation. Its always great to visit Glenburgh. Yesterday I had a really good time meeting with secondees who are working on assessment for SLC. They were so up for the challenge, looking forward to seeing what they come up with. Interesting talk with HT at Bankhead PS the other day, they are always innovative and this year are revamping their dialogue meetings re forward planning – they are calling this process their triangulation meetings. It sounded like real reflection and a focus on ,improvement was already happening through this process. They also showed me their new things in their grounds, from handmade places who had made them the most beautiful, sturdy outdoor play things. They were rightly proud of what they had in place, made me wish I was little and running about their playground. The recent Care Commission Report on Cathkin Community Nursery confirmed what we already knew – its an excellent establishment. But what are the key aspects about the establishment that make it so good? It would be difficult and not sensible to replicate what they do elsewhere as each establishment is set in a unique context, with its own uniques set of children, parents and staff but there are things which we can all learn from what takes place in Cathkin Community. The leadership of the nursery is exceptional – improvement planning and talking about improvement is a way of being at Cathkin Comm Nursery. This striving for excellence, for innovation, for better ways of doing things is evident as soon as you go in the door – the Nursery has an abundance of awards from a COSLA silver award, to SLC awards to certificates of staff CPD and children and parent achievement on display as soon as you go in and this sets the tone for everything else. The less formal achievement tree has little messages which are added to daily from stories from Mums about new babies, to wee ones who have leared something new at nursery or home to messages about how proud they are to have had a visitor. Everything is noticed, celebrated and the attention to this kind of small detail is very important. As you walk through the nursery the wall displays have a tone which has evolved over time – there’s a balance between published and children’s work but work which is displayed is linked to CfE principles and outcomes for instance if there’s a display with photos of playing outdoors – it won’t say that John was splashing in the puddles but that John was splashing in the puddles and he was exploring and appreciating the wonder of nature – everything is about learning. 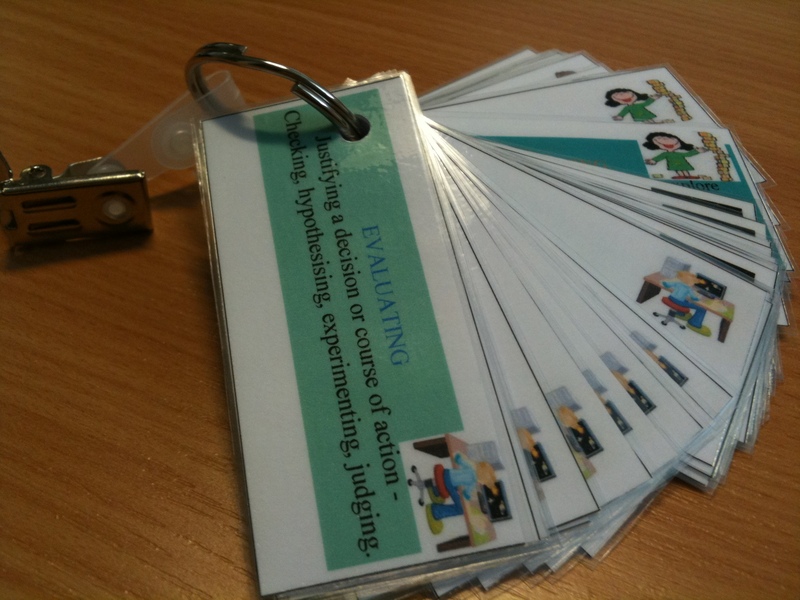 There are colour coded displays for each of the four capacities with photos/evidence to link to these. Floorbooks are displayed for the children and adults to look at with ones for different curricular areas, focus topics etc etc. 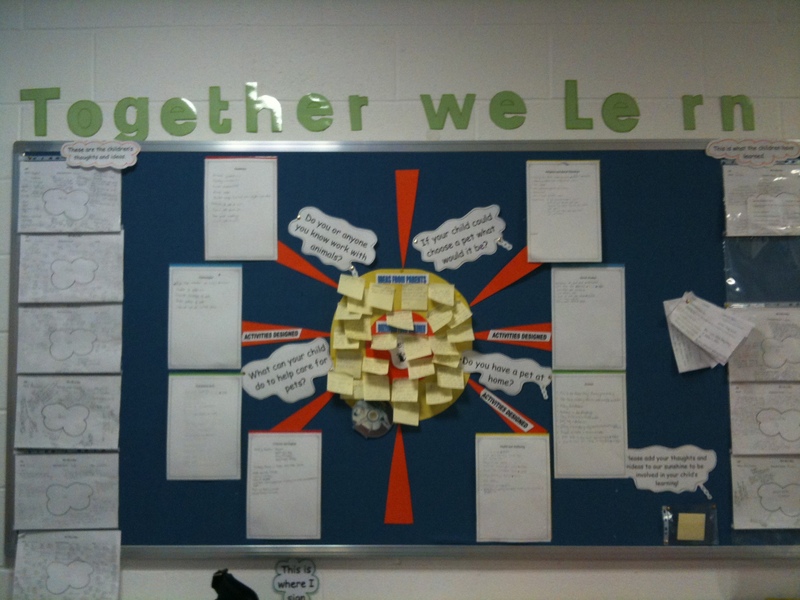 Planning is up on the walls with tips for the week related to learning and teaching. Children’s learning stories/portfolios are accessed by the children all the time so they can update them/read them and staff have a purposeful well planned way of doing assessments, running records etc. But none of this ever stays still for instance the learning stories are now being made into multi media resources. All staff have leaderhip roles of their own and most are involved in additional study such as PDAs BAs etc in their own time. Any innovative practices carried out have presentations written about them which other establishments can ask to see and use with their own staff. Visitors pop in and out and are welcomed at any time, doors are opened and you can have a good old nose to find good practice and this is openly encouraged! Self evaluation is circular and real. For instance questionnaires last session showed parents would like more courses etc, so the nursery applied for funding, got about £9000 and set up courses with a local college. I’m just off to see a fashion show shortly which parents are putting on after they’ve spent 10 weeks looking at their self esteem, how they present themselves/look after their health etc. Volunteers are welcomed, community links are fostered with everyone you meet knowing something about the nursery or having some involvement in visiting. Their vision and values are clear and embedded. They use the word ENABLE and their vision is linked to the word in a sort of acrostix. Then their aims are divided into parents, children, staff, community and management. These are then linked to the improvement plan. Cathkin Community Nursery where I visit is an inspirational place, their recent Care Commission report was graded at 6 all the way through. The first one we’ve had so far in South Lanarkshire. Well done Liz Mercer and team. This is well deserved and a great tribute to their ongoing work. I was at a “secret” show the other day at Calderwood Primary. The staff, pupils and friends had managed to keep quiet a little show they had developed to pay tribute to their HT Ann Kerr who retires today after being Head at Calderwood for 28 years. They sneaked into the hall with a big audience whilst Ann was waylaid elsewhere. This is your life tributes provided by her sister were fab. The children sang their hearts out and the staff got themselves together as a Queen tribute choir for the event with a treat being the Janny “Eddie” Mercury. Fantastic. A few tears were shed and it was clear just how many lives Ann has touched over the years. She’ll be sorely missed but I know she is really looking forward to the next phase in her life. Cathkin Community Nursery were involved in some filming yesterday for the EY DVD being produced by LTS to assist with CfE. They do some wonderful work there, so I’m sure they would have provided useful material to LTS.